In a medium sauce pan place berries, sugar, vinegar and water. Cook over low heat stirring often and mashing with the back of your spoon until sugar dissolves and berries break down. Remove from heat and allow to cool. In a small bowl, mix together butter and blue cheese. Remove from grill and allow to rest for 3 minutes. Slice into 1/4- slices. Will yield 20 slices. Spread one side of each roll with the blue cheese butter. 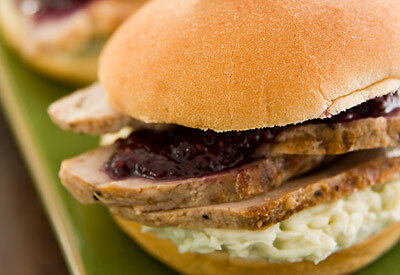 Top with 2 slices of tenderloin and a spoonful of berry sauce. Secure with a decorative skewer and a berry. Wrap in parchment and pack for the game!